For some people one of the biggest questions surrounding the release of Pokemon Let's Go is the ability to transfer their hard-caught Pokemon from Pokemon Go to the new Switch game. But understanding how to transfer Pokemon from Pokemon Go to Let's Go is actually a fairly complicated affair, and one that's not that well explained in-game. Thankfully, I spent an evening figuring it out for you, and now can tell you exactly how to transfer Pokemon from Pokemon Go to Let's Go in the most straightforward way possible, and offer you some tips along the way too. And don't forget, this is also how to catch Meltan in Pokemon Go, so it'll definitely benefit those completionists. First things first, let's make sure both your accounts are synced together for transferring action. To do this, on your Switch head to the Settings Menu within Pokemon Let's Go, and click the very top option - 'Open Pokemon Go settings'. It'll give you a little warning about data use, and then ask if you want to pair your game with a Pokemon GO account. Hit Yes. Then, grab your phone and open up Pokemon Go. Hit the Pokeball, navigate to Settings, and then scroll all the way down to where it says 'Nintendo Switch'. Inside this sub-menu, go for the 'Connect to Nintendo Switch' option, which will then search for your Switch using Bluetooth connection (so make sure your phone's Bluetooth is turned on). On your Switch, you'll get a prompt saying that your Pokemon Go account has been found, and it'll ask you whether you want to pair your game. Opt for yes, and after a short communication between the pair of devices, you'll be all paired up and raring to transfer. It's worth remembering that you can do this with any Pokemon Go account - it doesn't just have to be yours - so if your friend has something you really want for your Pokemon Let's Go Pokedex, or has some spare Pokemon they can transfer to help unlock the mini-game (more on that later), it's possible. Now that your two accounts are all paired up, you'll need to head to Go Park in Fuchsia City in Pokemon Let's Go in order to start transferring your Pokemon. It's quite a way into the main storyline of Let's Go, so you won't be able to get access to your arsenal of Pokemon Go critters until you've done at least a few gyms, and weaved your way to Fuchsia City. The Go Park is to the north of the City, where Pokemon Yellow players would have found the Safari Park. Head inside the Go Park and speak to the receptionist at the desk on the left of the PokeStop-shaped Portal. Here, choose the option 'Bring Pokemon', choose whatever Go Park you want to use (there are 20, which each hold 50 Pokemon) and then it'll go through a similar process to the original sync. However, don't panic, you're already connected, so just move onto the next step. Here's where things aren't as straightforward as they should be, as to start transferring Pokemon from Pokemon Go to Let's Go, you need to go to your Pokemon list inside Pokemon Go. You'll now see a little Switch icon in the top right hand corner by the search icon. Hit that and it'll turn red. Now, just select all the Pokemon you want to transfer to your Switch game, and then hit the big green button at the bottom that says 'Send to Nintendo Switch'. It'll double check you actually want to send them, twice, and then you'll see your little critters flying off to their new home within your Go Park. All you have to do on the Switch side is accept them. Once your little critters have wiggled their way across the Bluetooth waves, it's time to go and visit them in whichever Go Park you dumped them (gently) into. Go back to the front desk, speak to your new pal, choose 'Enter a Go Park' and then choose whichever Park you want. You'll then be transported into your Go Park where you'll see all your transfers frolicking in the greenery, literally having the best time. It basically acts as the Safari Park from Pokemon Yellow, but you're having to provide the exhibits from Pokemon Go. But of course, you haven't really transferred them here for a holiday, have you? It's time to start adding them to your Pokemon Let's Go Pokedex. Go up to any of the Pokemon inside the Go Park and hit A to interact with them. You'll be given the option to either "catch" or "move" that Pokemon. If you want to send them to a different Go Park hit 'move', but other just go with 'catch' to enter the catching process to attempt to add them to your Pokedex and overall Let's Go collection. Thankfully, if they flee from the battle they will literally just go back into the Go Park, rather than being lost forever. All you need to do is try again. Of course, there's also another reason to transfer Pokemon from Pokemon Go to Let's Go, and that's the Play Yard. If you transfer 25 of the same Pokemon into the Go Park from Pokemon Go, you'll be able to enter the Play Yard for that specific Pokemon and unlock a secret mini-game that'll earn you candy for that critter. 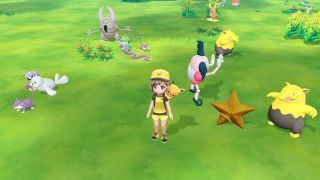 From what we've seen so far, they're all rather adorable, but it might take a while for you to unlock them all - especially as you can't count any of the Pokemon you've caught in Pokemon Let's Go towards that 25 total. It's Pokemon Go transfers only. Also, all 25 Pokemon have to be physically in the Go Park at the same time to access the mini-game. They don't all have to be in the same Park though. You have 20 Go Parks to choose from, each holding up to 50 Pokemon, meaning you can have up to 1000 Pokemon stored there at any one time. That basically equates to 40 mini-games active at once. Enjoy transferring, trainers! If you want more ways to enjoy Pikachu and Eevee's latest adventures, why not check out how to unlock all Pokemon Let's Go hairstyles, to make sure your little buddy is fashionable AF?